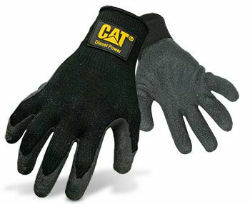 Glove features the CAT® Diesel Power Logo. Poly/cotton breathable knit. Fully coated latex palm and fingers helps protect against cuts, abrasions, and punctures. Provides a snug flexible fit with an excellent grip.